The (combustion) air filter prevents abrasive particulate matter from entering the engine's cylinders, where it would cause mechanical wear and oil contamination. Most fuel injected vehicles use a pleated paper filter element in the form of a flat panel. This filter is usually placed inside a plastic box connected to the throttle body with an intake tube. Older vehicles that use carburetors or throttle body fuel injection typically use a cylindrical air filter, usually a few inches high and between 6 and 16 inches in diameter. This is positioned above the carburetor or throttle body, usually in a metal or plastic container which may incorporate ducting to provide cool and/or warm inlet air, and secured with a metal or plastic lid. Typical symptoms for a clogged air filter are for example: Driving, unsteady idle speed and weak acceleration, but also problems when starting the car starting problems and an increased fuel consumption (based on average mileage) and the currently measured mileage or abnormal exhaust fumes. A typical starting problem which is connected to this problem is a barely or not starting engine in combination with a starter that turns over. 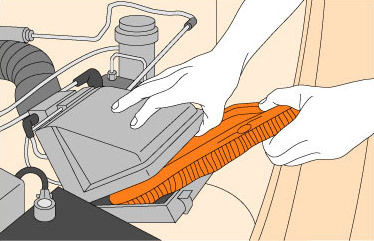 A clogged air filter can cause black exhaust fumes which will turn the color of the exhaust pipe to sooty black. A clogged air filter needs to be replaced by a new one. Therefore, the air filter housing have to be found. It will be either square (on fuel-injected engines) or round (on older carbureted engines) and about 12 inches (30 cm) in diameter. After locating the housing the screws or clambs on the top of it have to be removed. Now the old air filter can be removed. At this point the housing should be cleaned from any dirt and debris with a clean rag. Finally the new air filter can be put in and the top of the housing can be screwed or clambed back on.